I really enjoyed the PELeCON conference. I liked the format; in terms of the mix of themed sessions, interactive workshops and lots of keynotes. Unfortunately there were less people at the conference this year, which is a shame as it was excellent. It was good to meet up with old friends and to finally meet people I interact with on twitter and flickr, in particular the Irish contingent – Catherine Cronin, Mary Loftus and Pam O’Brien. There were lots of opportunities to chat and network. 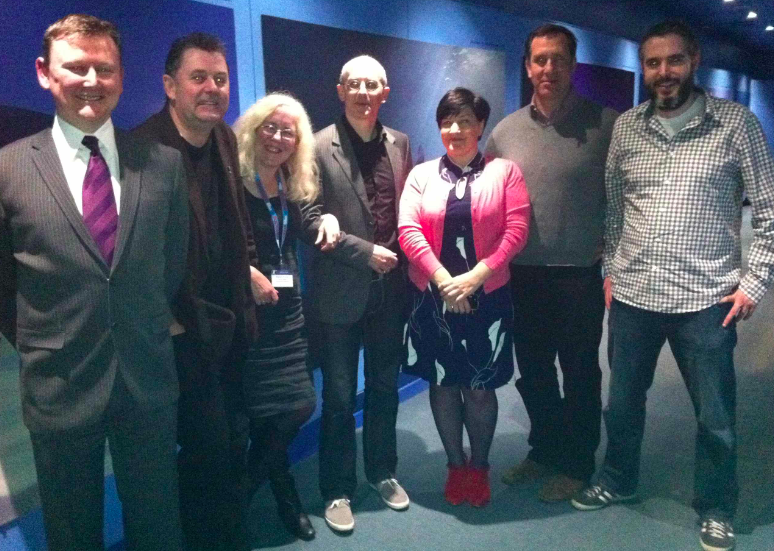 Great also to finally meet Don Taylor, Steve Bunce and Doug Belshaw (herby known as the bearded one). Digital literacies seemed to be a recurrent theme across many of the sessions, which was great as it aligned to one of the key themes of my keynote. I’m working up a paper to go alongside my presentation, which is turning into a mini-thesis! Will blog about in due course, but here is a summary of the main themes I covered in the talk. I really like this, as I think it should at the forefront of our minds when we are designing learning interventions. I then described an elearning timeline, highlighting key milestones; from rich multimedia resources in the late eighties through to MOOCs in the last few years. I focused in particular on some of the key characteristics of social and participatory media, such as distributed, networked, open, dynamic, social, complex and participatory. I then summarized some of the findings from the MATEL study which has done an in-depth analysis of emergent technologies across four sectors: schools, tertiary, VET and adult learning. I then described the meta-learning model, I have recently blogged about and showed how it could be used to map different pedagogical approaches. I then shared four examples of how technologies can be used to promote different pedagogical approaches, namely: drill and practice, mobile learning, situative learning, and immersive learning. I then shared some of my current thinking on the relationship between identity, presence and interaction online. I argued that identity is how you present yourself online and how you interact and communicate with others. I used Mark Childs’ definition of presence as consisting of four aspects: mediated presence (“being there”/immersion), social presence (projection of ourselves, perception of others), copresence (being somewhere with others) and self presence (or embodiment). Finally in terms interaction I drew on Moore’s transactional distance work (Moore 1989)(interaction between learner and teacher, learners and learners, learners and content) and Hillan et al.’ additional dimension (learning and interface) (Hillman, Willis et al. 1994). The final part of the talk argued that despite the potential of technologies there is a gap between the promise and reality and that teachers need guidance and support to make pedagogically informed design decisions, that make good use of technologies and outlined our work on the 7Cs of Learning Design. I’ve posted my final slides on slideshare. Hillman, D. C., D. J. Willis, et al. (1994). “Learner-interface interaction in distance education: an extension of contemporary models and strategies for practitioners.” The American Journal of Distance Education 8(2): 30-42. Moore, M. (1989). “Three types of interaction.” American Journal of Distance Education 3(2): 1-6. Donald Taylor, the James Bond of e-learning apparently ;-), gave the closing keynote at this year’s PELeCON conference. The title of his talk was ‘Does learning and development have a future?’ He began by asking us to think about how our roles have changes in the last five years as a result of technology. For me technologies have had a transformative impact on my practice. Blogging is an important way for me to develop or work up ideas or simply summarise interesting things I have seen or read. Some of the things others in the audience suggested included: the increasing importance of social media, the importance of fb, the way in which technologies enable you to have a higher profile as a research and hence have more impact, the importance of blogging, the fact that we are sharing more and the higher expectations or the 24/7 culture. Intangible values – the fact that there has been a shift in companies from having a high percentage of tangible assets to a high percentage on intangible assets, i.e. it is no longer physical objects that are of value, but people skills and ideas. Our belief is that deep, radical and urgent transformation is required in higher education as much as it is in school systems. Our fear is that, perhaps as a result of complacency, caution or anxiety, or a combination of all three, the pace of change is too slow and the nature of change too incremental. He gave some startling statistics in terms of investments in e-learning: $9.1 bn Pearson, $4.7 bn Phoenix University, $32 bn Endorsement of Harward University, $6.5 bn Cambridge University, and $1.9 bn the global market for Learning Management Systems. He concluded by arguing that despite the potential of technologies to be transformative, there are barriers, in particular, digital inclusion/exclusion and a replication of the old boys network. So the key message for me was - will technologies be transformative or disruptive or both? Barber, M., K. Donnelly, et al. (2013). An avalanche is coming: Higher education and the revolution ahead, http://www.ippr.org/publication/55/10432/an-avalanche-is-coming-higher-education-and-the-revolution-ahead. Naughton, J. (2012). From Gutenberg to Zuckerberg, what you really need to know about the internet. Weller, M. (2011). The digital scholar - how technology is changing academic practice. London, Bloomsbury Academic. One of this year’s PELeCON conference keynotes was my friend Joyce Seitzinger from Deakin University. This blog post is a summary of her talk, the slides are available online. She started by stating that winning a place for technology is easy, whereas winning people for technology is hard. The talk gave a nice overview of some new tools and how they can be used, as well as Joyce reflecting on her own use of social media. She referred to Hegarthy and Kelly’s work on staff development models. Other references included ‘The information diet’ by Clay Johnson and ‘Is Google making us stupid?’ by Nicholas Carr. She showed a really nice infographic illustrating social media and how they can be used to support different activities. She agrees with Clay Shirkey’s assertion that it is not information overload, but filter failure. We can harness the power of our distributed social network of peers to act as filters and aggregators for us. She stated that ‘my network is my filter and my lifeline’. 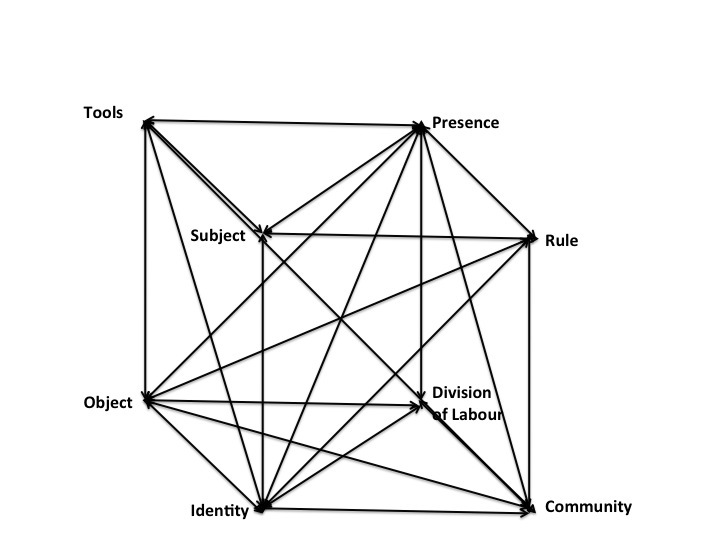 She described three types of interaction, team based, Community of Practice and Networked, which is similar to Dron and Anderson’s concepts of groups, networks and collectives (Dron and Anderson 2007). She also referenced Wenger et al.’s book ‘Digital Habitus’about the stewarding of technologies (Wenger, White et al. 2009). She when on to describe the Netprax project that she is involved with at Deakin, which is trying to help academics make more effective use of social media. 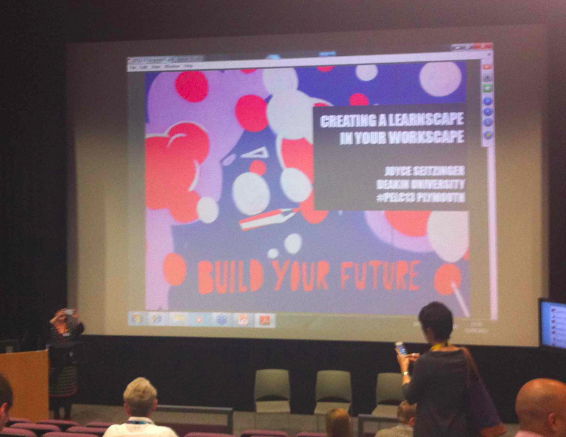 The project is using a range of tools, include Yammer, fb, blogs and Twitter. She also referenced Dave White’s work on digital visitors and digital residents and also Martin Weller’s book ‘The digital scholar’. 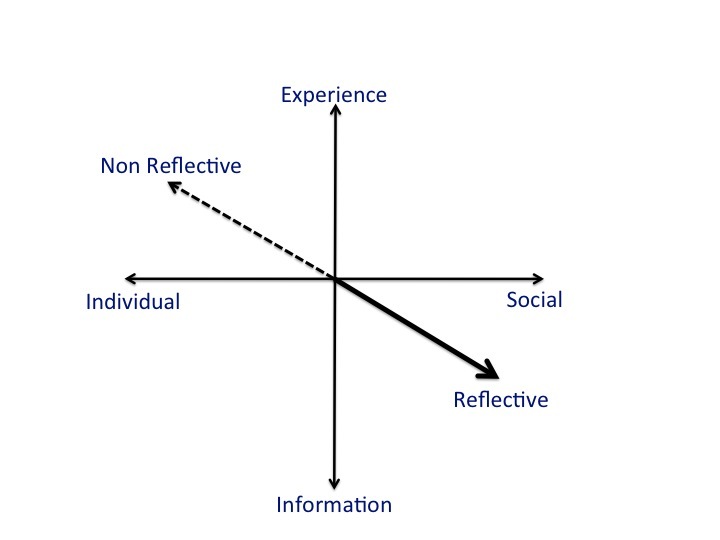 She argued that becoming a networked learner was an example of a phenomenal experience, i.e. something that fundamentally changes you. She then shared a number of interesting sites, including: about.me, visual.ly, vizify.com and visualize.me. She finished by quoting from John Naughton’s recent book (Naughton 2012) that we overestimate the short term impact of new technologies and under estimate their long term impact. Dron, J. and T. Anderson (2007). Collectives, networks and groups in social software for e-Learning. Proceedings of World Conference on E-Learning in Corporate, Government, Healthcare, and Higher Education Quebec. Retrieved Feb. 16: 2008. Wenger, E., N. White, et al. (2009). Digital Habitus - stewarding technology for communities. Portland, OR, CPsquare. I always told you so! He then introduced the concept of Pedagogical Patterns, derived fro Alexander’s work (Alexander, Ishikawa et al. 1977). He defined patterns as formal structures for tackling a problem and providing a solution in a real world context. A Pattern describes a problem which occurs over and over again and describes the core of the solution. Pedagogical Patterns capture and reuse well known designs and provide a common language for describing them. He referenced the Pedagogical Patterns collection website. In the second half of his talk, he focused on Learning Analytics, and in particular how data can be harnessed by both teachers and learners. He highlighted George Siemens’ distinction between Learning Analytics and Academic Analytics. After describing some of the benefits of Learning Analytics and the ways in which they can be used, he listed a number of issues: ethics, legality, neutrality, Art vs. Science of teaching, Objective vs. Subjective interpretation and ocularcentrism i.e. representations become true. He concluded by arguing that design is both human and meaningful and that models are active and effective. Alexander, C., S. Ishikawa, et al. (1977). A pattern language: towns, buildings, construction, Oxford University Press, USA. Awareness – there was a lack of understanding of digital literacies and their importance for employability. 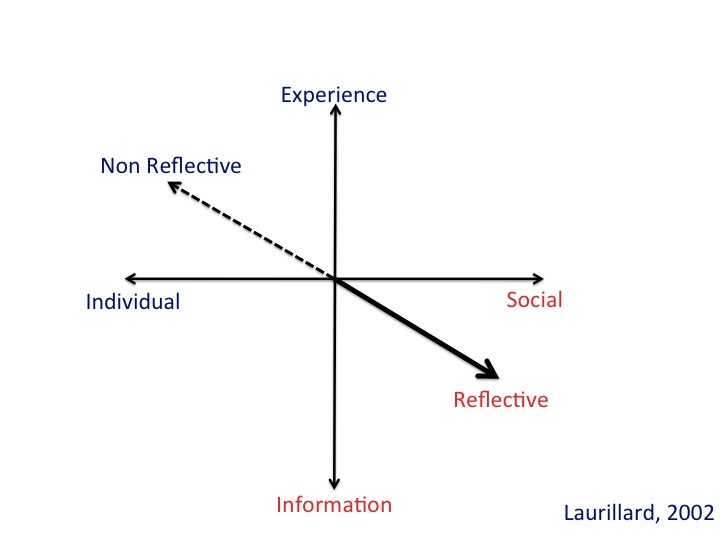 Reflection and articulation – there was a need to bridge the gap between learning and applying digital skills in a professional context. The importance of monitoring and assessment. Tangible outputs – in terms of having something to show/evidence and development of a sense of ownership. The importance of having a positive online presence. The need to develop social media skills. 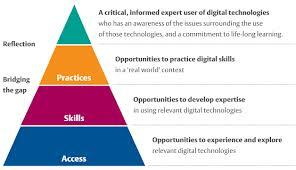 That practitioners need time to develop and practice digital skills. The importance of continued contact with supervisors and co-workers during placement. The importance of promoting the digital placement experience. Developing a maximum digital benefit for work-based learning. More change will happen in Education in the next ten years, than in the past 100. She described a number of initiatives including CODER DOJO (a community to help kids develop coding skills), MOOCs and Google+. She argued that there was an inter-dependence between digital literacies, social media and digital identity. She listed Doug Belshaw’s eight aspects of digital literacy (cultural, cognitive, constructed, communicative, conflict, creative, critical and civic). She went on to describe a project in her own institution around a course on developing professional skills, which got the students to think about which tools they were using and how they were using them. She referenced Howard Reingold’s five social media literacies, danah boyd’s work on ‘networked publics’ and Bonnie Stwarts work on academic and networked learning . Mark Childs gave a talk on Friday at Leicester. This blog post is a summary of the key points. His talk focused on his research on Virtual Worlds. He provided three examples. 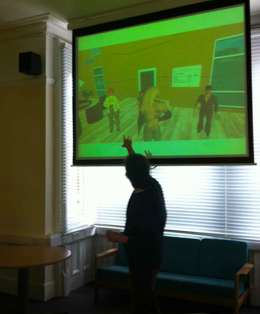 The first was the use of SecondLife for disaster management communication. This was in conjunction with Yung-Fang Chen and El Parker in Coventry. It was a conversion of a table-top exercise, shop where the students take on the roles of different agencies after a natural disaster. One students in pairs travels from office to office in SL and negotiate on behalf of their agencies. The other stays at base. The student found it a complicated environment. Note cards in SL were available with instructions, free viagra and the students could walk around the environments and click on different note cards. However, cialis this resulted in cognitive overload, a solution would be to print out the note cards. Evaluation of the students’ experience elicited the following points. In terms of their avatars, they could play about with them and personalise them. Would it be possible to use the avatars to signify different roles, by using uniforms for example? Interestingly, the participants didn’t identify with the avatars. They were characters as a means of interaction. And they found it difficult to identify with the roles of others in game. ‘In the computer, there is no extra talking.’ It varied as to whether funny avatars were a hindrance or a help. The design of the world was fairly basic and students didn’t experience it as particularly realistic. In essence, it was ‘a fake real world’. They wanted more emotional resonances so it felt tense, time dependent, e.g. actual refugees, collapsed building etc. Finally, engagement was not through the design of world but through motivation to try out things they had learnt. The second example focussed on learning goals in a BA Media and Communication at Newman College and in particular, a module on media futures. Journal entries related to module themes and student were assessed on two entries related to one theme. 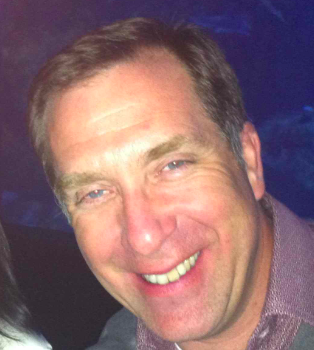 Mark was a guest lecturer on the course in support of the theme of identity. Findings, included the value of text as a means of feeling connected, and the value of ‘para-linguistic’ things. There was both a standard lecture space and a sand box. The learners were given tasks of interpreting appearance of avatars and they used voice for presentation, and text for dialogue. In terms of student interaction, there was little participation – ‘isn’t anyone contributing today? Room seems very quiet.’ The students were asked to build an identity cube and volunteers can then discuss what this means. This is based on Carina Girvan Sleepy Littlething. They were given instructions on creating cubes and had to upload 5 images to add to the cubes faces. The theme was something that represented them and their identity. Mark argued that this gives them a way to focus on what they are doing, reification (thingness). And through this they can then get to their concepts of identity. The creating of the cubes gave the abstraction of identity a solidity, which provided a basis for exploration and it related to Wenger’s notion of reification or thingness. The activity appeared to have energized the students and gave a springboard for their ideas. 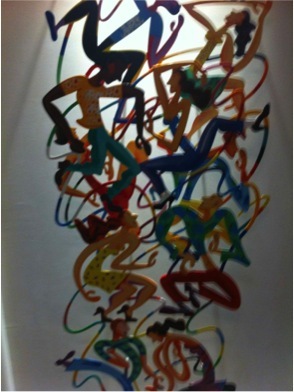 However, it can lead to distraction, discussion of abstractions still limited, but raises awareness of themes. In the last part of his talk, mark explored some of the definitions and concepts associated with the virtual experience. 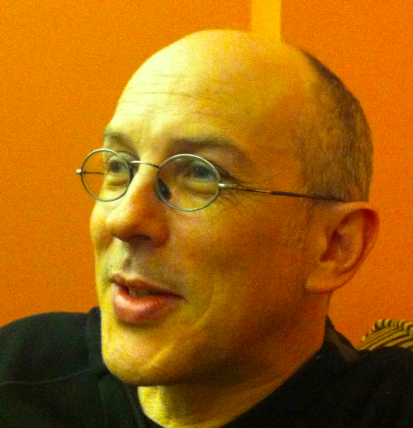 The defined Virtual Worlds as: ‘synchronous and persistent network of people and programs embodied as avatars and agents facilitated by networked computers using navigable space to engage the user’s belief’. In terms of space: these are navigable consistent spaces with physics. All give rise to mediated presence. Similar to gamespaces ritual spaces theatrical spaces, bounded spaces in which separate rules and conventions exist and which have a heightened semiotic system that requires engagement of belief – fourth places. He finds the ‘Conscious Competence Learning Matrix’ www.cognitivedesignsolutions.com. He referenced Barrett 2002: 35 Cycle of disengagement and Caspi and Balu 2008: 339 Cycle of engagement. For each tool they then provide: a description of the tool, discuss the educational challenges and the opportunities the tool provides for learning, the strengths of the resource, and potential disadvantages. They conclude with a chapter on the constraints on course design from the perspective of students, teachers and institutions. Rennie, F. and T. Morrison (2012). 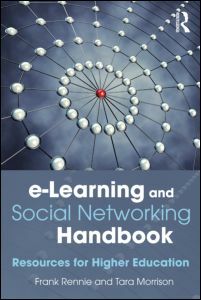 e-Learning and social networking handbook - resources for higher education. London, Routledge. Leicester is the fifth institution I have worked at. It is a great place to work and the people in my department (the Institute of Learning Innovation) are fantastic. We have a vibrant community of PhD students and visiting scholars. So I feel very much part of the University of Leicester. However, there this sense of community is secondary to the sense of community I feel with my wider network of peers through social media such a Facebook, Twitter, Flickr, the blogosphere and Skype. I love the variety of connections I have across these media, the comments and the banter, the intellectual debate, the serendipitous learning through links others provide or via blog posts. Indeed my last blog post on haptic technologies was prompted by a blog post by David Hopkins, which I came across this morning on Twitter. 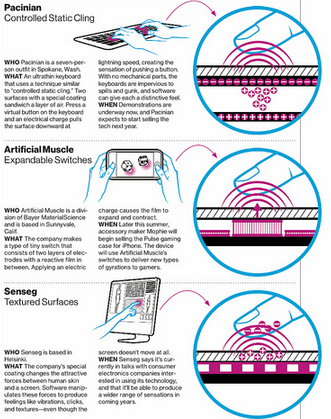 These technologies have truly transformed the way I work and even the way I think. Ideas are sparked through the postings of others, comments on my blog help develop my ideas and in turn spark new thoughts. The dynamic and immediate communication is so much more valuable than developing ideas through the torturously slow journal publication route, it can take years for publications to be published and then at best only a hand full of people might read the article and it is highly unlikely than anyone will comment or provide feedback on the piece. Through social media we now have an amazing way of co-constructing knowledge, we feed off each other. I wonder if any research has been done on how this has changed the nature of research? There is of course the book ‘The Digital Scholar – how technology is transforming scholarly practice’ by Martin Weller, in which he argues that there are three characteristics associated with being a digital scholar: open, networked and distributed. Cristina Costa’s thesis (The Participatory Web in the context of academic research: landscapes of change and conflict) applied a Bourdieun theoretical lens on the concept of digital scholarship. The thesis focused on the use of participatory media to promote digital scholarship and foster innovative approaches in the communication and dissemination of research. A narrative inquiry methodology was used, along with the use of Bourdieu’s concepts of social capital, habitus, field and violence as a theoretical lens to understand the research findings. I think we need more research into the nature of digital scholarship and its role in developing research ideas. We need to better understand how social media are influencing our ideas and what are the implications for the taking forward of our research field. Presence is a combination of mediated presence (“being there” aka immersion) + social presence (projection of ourselves, perception of others) + copresence (being somewhere with others) + self presence (or embodiment). By introducing touch in this way you can bring any substance or texture to the classroom where it would not be possible (or safe) to do so. What does moon rock feel like? What does hard enamel tell you about the integrity of a tooth? What does the surface of a scarf feel like when it’s frozen in liquid nitrogen? How do you spot a possible failure in an engine block when it’s running at 9000 rpm. To experience these things can bring the subject, the science, the learning alive where you would not always be able to? So haptic technologies enable you to experience the textuality of things you may not be able to access in the physical world; either because it is not available or because it is unsafe to do so. It allows Medical and Dental students to practice and develop their skills in an authentic and textual environment, before unleashing them on the real world. So, through technologies, we now have a full spectrum of experiences; from the social and connected interaction with others through social media and the power of ‘text-plus’ (i.e. text plus emoticons, hashtags, brackets, etc. ), through the ‘virtual physicality’ of Virtual Worlds, and through the touch-based experience of haptic technologies. As a result the boundaries between real and virtual are truly blurred. What do these various digital spaces mean in terms of presence, experience, immersion and identity? And how can they be harnessed to promote different pedagogical approaches? You are currently browsing the e4innovation weblog archives for April, 2013.